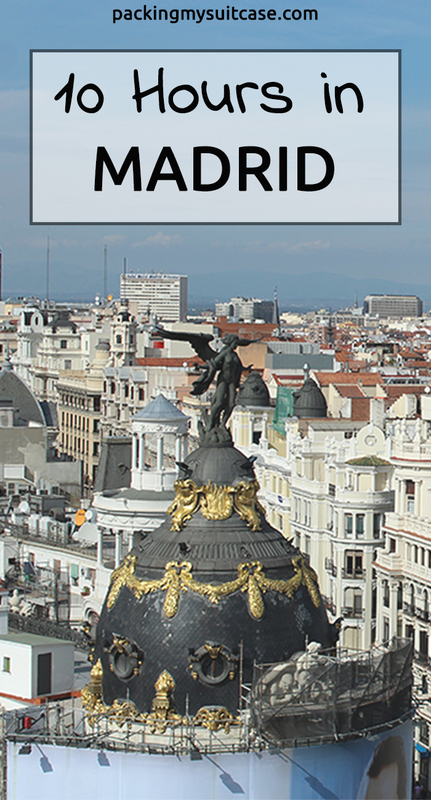 When I booked my flights to and from Brazil with Iberia, I would only have a 2-hour layover at Madrid’s airport. However, about 1 month before my departure, the company informed me that my original return flight from Madrid to Munich was cancelled and the next one available would make me have a 10-hour layover instead of 2. I was not mad at all. Let’s be clear, I love Madrid, it is a place I would definitely even live if I had the opportunity. But, these 10 hours were going to be very tiring. Previous to arriving in Madrid, I would have had 2 other flights, a 3,5 hours flight from Fortaleza to São Paulo, then 4 hours at the airport waiting for a 10-hour flight to Madrid. Yup! So the reality was: when I arrived in Madrid I was more than tired. I was dead, and wishing I could sleep on my bed – I only slept for 2 hours altogether, as you know, I don’t really sleep on planes. The great news are: previous to this trip I made a little list of things I wanted to do and places I wanted to visit in Madrid, and well, I love this town, tired or not. 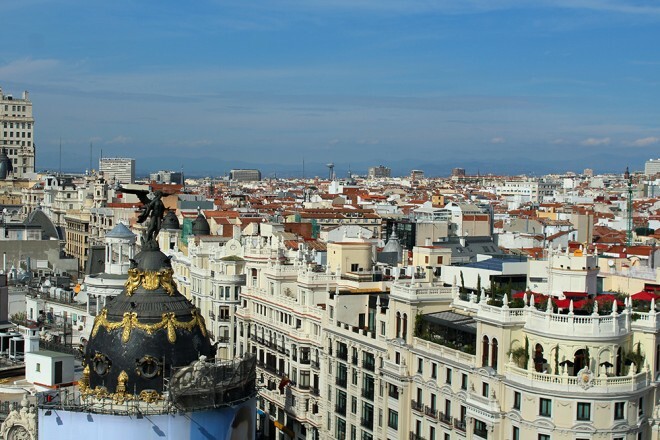 While I was researching for a place where I could have great views over town, coincidently I found a great post about rooftops in Madrid, written by Virginia Duran. And guess what? We kept in touch and ended up meeting while I was there. It was my first stop after leaving the airport at 6 in the morning. 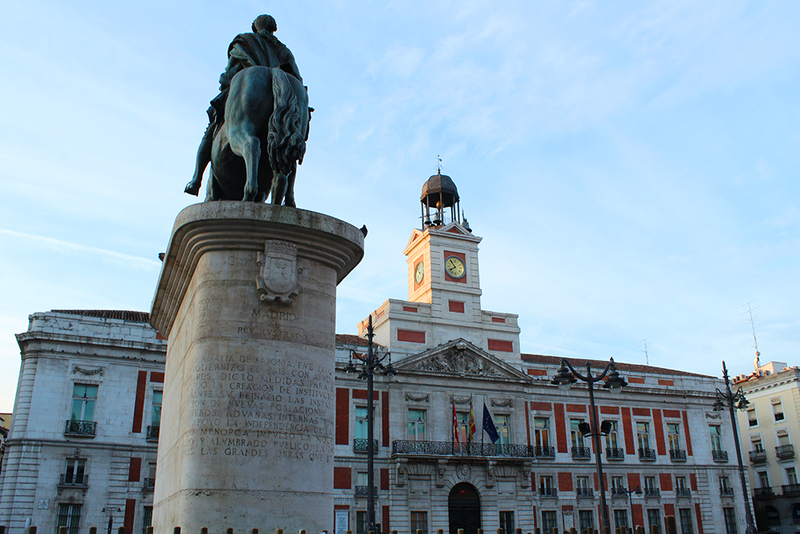 Puerta del Sol was originally one of the city gates, and today is the busiest place in town, from here you can get basically anywhere. I still remember spending New Year’s Eve here once, and having the traditional 12 grapes. As I arrived there pretty early, I got to see people still organizing the square with tables and chairs. 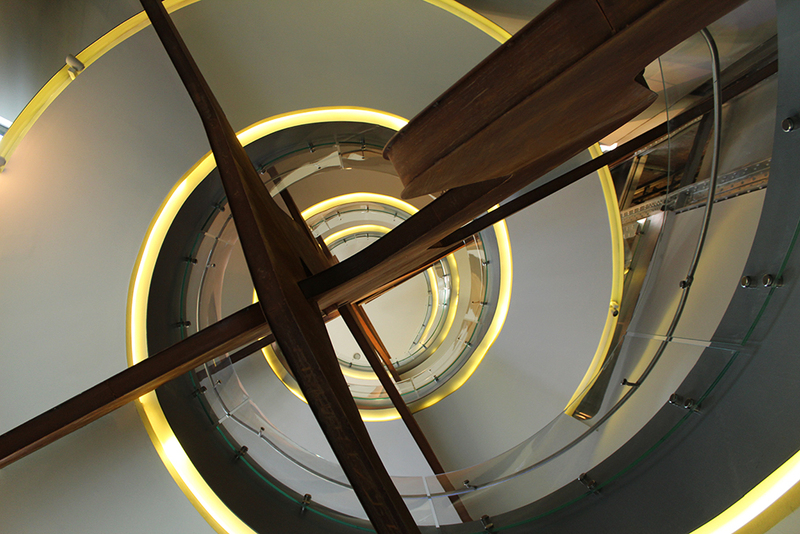 Here is a famous place to have a coffee and watch passers by, a place not to be missed. 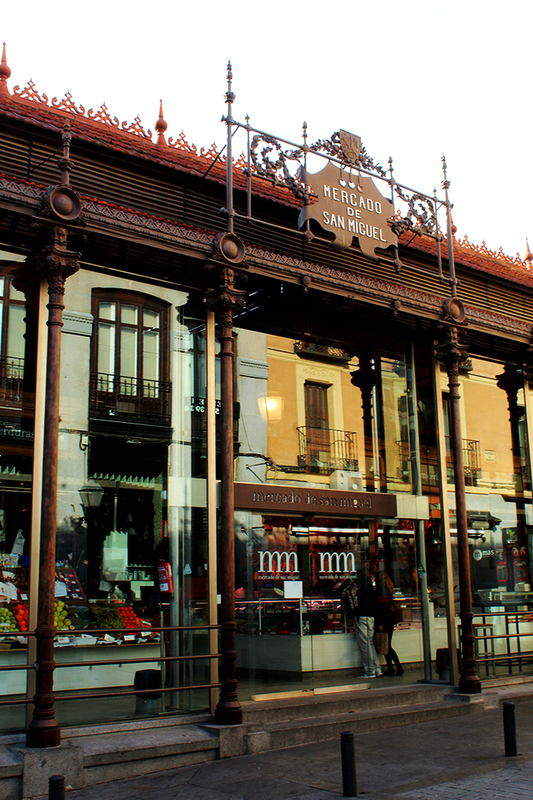 Breakfast was nothing less than at the famous Chocolateria San Ginés, well know for its amazing hot chocolate – it really is amazing – and churros. I could have spent the rest of my remaining hours in Madrid eating here. It was just a quick stop to take a look at the most famous market in town. Did you know that it was falling apart until private investors bought it, restored it and made it one of the top markets in Europe? Day and night, at the Mercado San Miguel you don’t only find fresh products, but also a bar. Nothing less than where the Spanish royalty get married, and it is stunning from the inside and the outside. 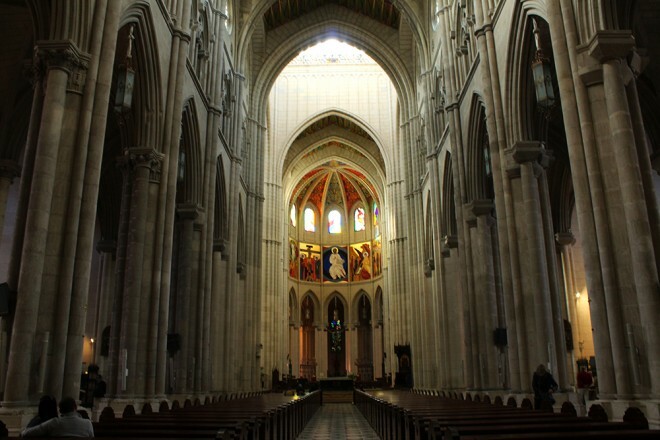 Except on Sundays – I was there exactly on a Sunday – it is possible to climb the stairs of the cathedral and have a stunning view over Madrid. 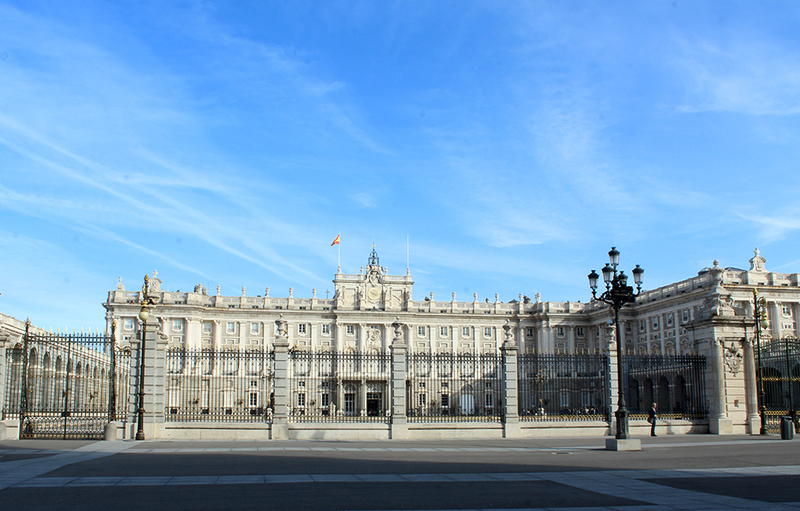 Right beside the cathedral is the Royal Palace. The royalty doesn’t live here anymore, and on the visit to the inside you are able to see only a few rooms. In any case, the place is amazing from the outside, also from the gardens behind it. If you never heard of this place before, you probably won’t believe me if I tell you that this monument was originally built in Aswan, Egypt in 200 BC. And how did it end up in Madrid? Because of the construction of Aswan High Dam and the consequent threat to many monuments and archeological sites, UNESCO made an international call to save this important part of the world’s history. Since Spain was one of the helpers on saving the temples of Abu Simbel, Egypt donated the Debod temple to the country in 1968. Crazy story huh? And the temple is beautiful. 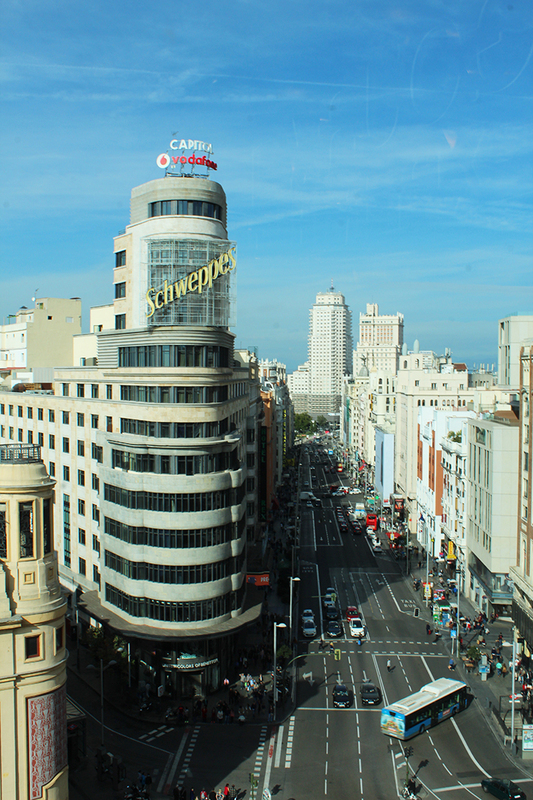 Known as the Spanish Broadway, Gran Vía is probably the most famous street in Madrid. Great mainly for shopping, but also home of famous buildings such as the Fundación Telefonica, and places where you can have a great view over the avenue, like El Corte Inglés and the Hotel Vincci 66. Nothing like strolling around Grand Vía. 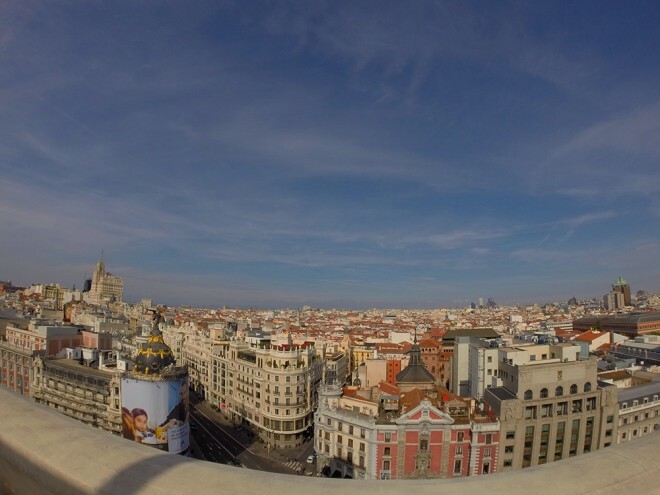 One of the coolest rooftops of Madrid is Tartan, where is possible to eat and have some delicious cocktails, contemplating a stunning view from the terrace. 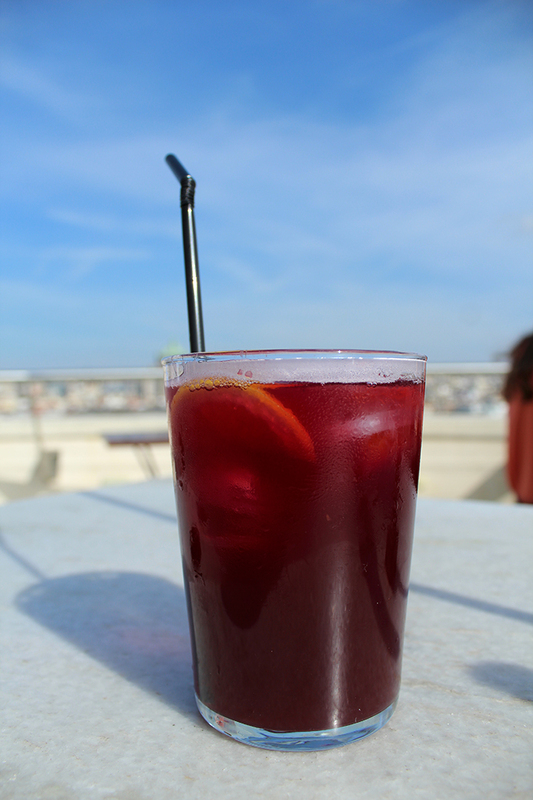 After such a long journey, I deserved to have a Tinto de Verano, a popular drink in Spain similar to Sangría. Ok, so I was told by a Madrileña that this fountain isn’t really what it seems to be. 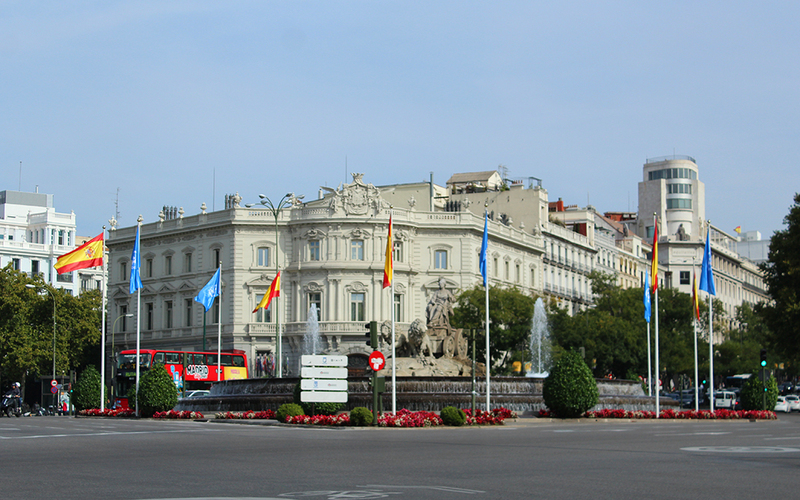 People say that under it, there is the safe of Bank of Spain – located also at Plaza Cibeles – and if anyone ever tries to steal it, the fountain will drown. Hmmm, so now you know that there is much more to this fountain than the celebration of one more championship won by Real Madrid. 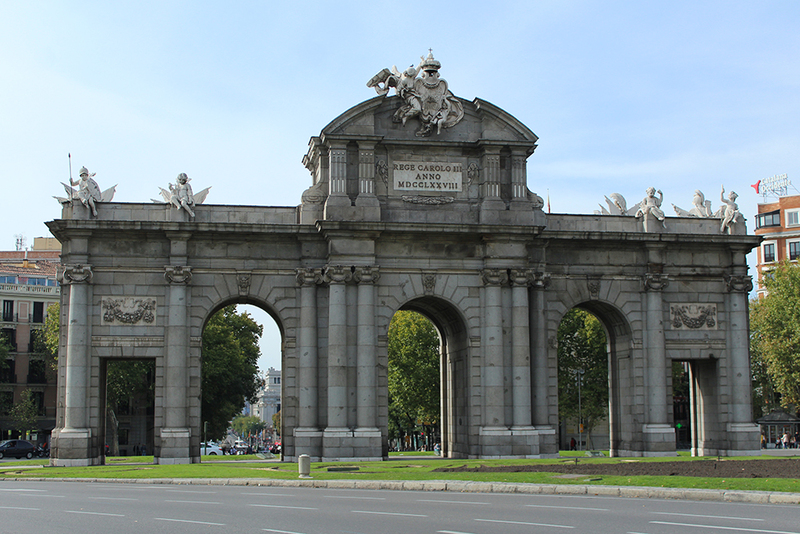 This Neo-classic monument is located at Plaza de la Independencia – Independence Square – near the famous Buen Retiro Park. It was one of the city gates, connecting Madrid to the city of Alcalá de Henares. Around this area is where you will have the most expensive coffee in town, for around 5€. 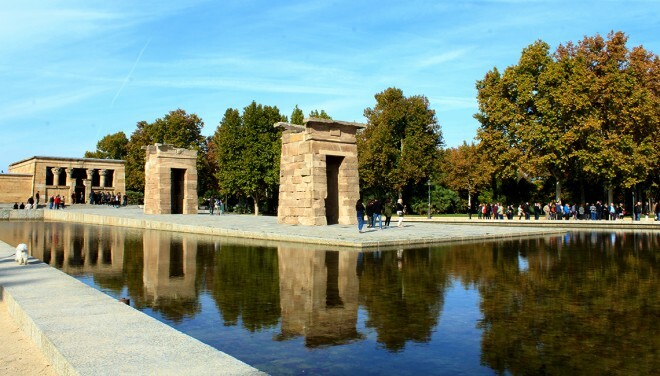 This Park remained in my memory since the first time I visited Madrid, in 2003, and then in 2006. It was nice to return now in 2015 and see that the place is still amazing, maybe even more than I remembered it. No doubt a must in Madrid! Do buy the Madrid Card for 24 hours, and add the Madrid Tourist Travel Pass, this way you will be able to have unlimited access to public transportation, get free entrances to more than 50 attractions and still get discounts in restaurants and shopping. Don’t forget the Metro Map. Check out more amazing rooftops in Madrid. I visited all these attraction by foot. Madrid center city isn’t so big, so if you are willing to walk, you will be able to see a lot more than if using the metro. You don’t have to do everything I did. In fact, what I did was pretty crazy, and it was only possible because I had a great guide, thanks Virginia! But you can pick your favourites and focus on them. However, there is a must: you have to plan and stick to a schedule, otherwise you will miss your plane! 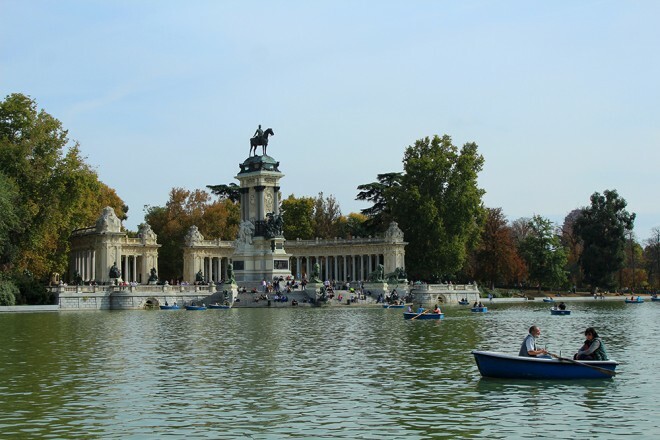 If you have more time in town, then there is much more than this to explore in Madrid, and I’m sure you will have a wonderful time there. Well look at you making the most of it!! Whenever I have lay overs I cringe. But it has always ended up being a nice surprise. So happy to see you explored a lot! I also prefer not having lay overs! Awesome! Btw, did you leave behind your luggage in Madrid airport, or is it part of the transit? 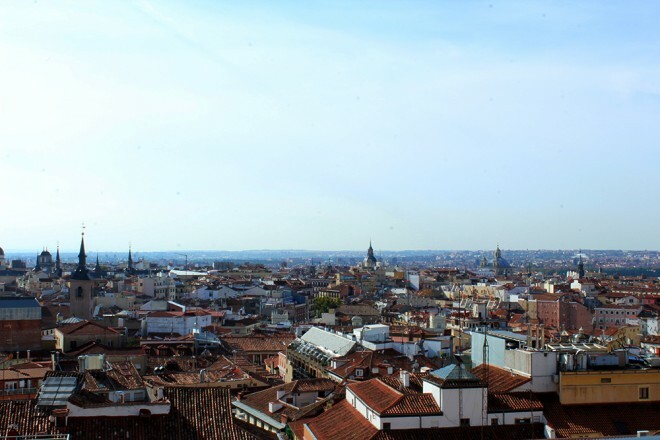 I once had a 7 hour layover in Madrid (that means 4 solid hours?) and I really wanted to explore the city but my friends just wanted to eat a jamon place! Still I saw Puerta del Sol and ate churros (and jamon). I definitely have to return one day. I miss Madrid! My favorite area is all the side streets between Retiro and Sol, with the trompe l’oleil murals. My biggest frustration has always been with Plaza Mayor – I feel like because of its shape or because buildings are low or whatever, but it’s impossible to do it justice in photos. 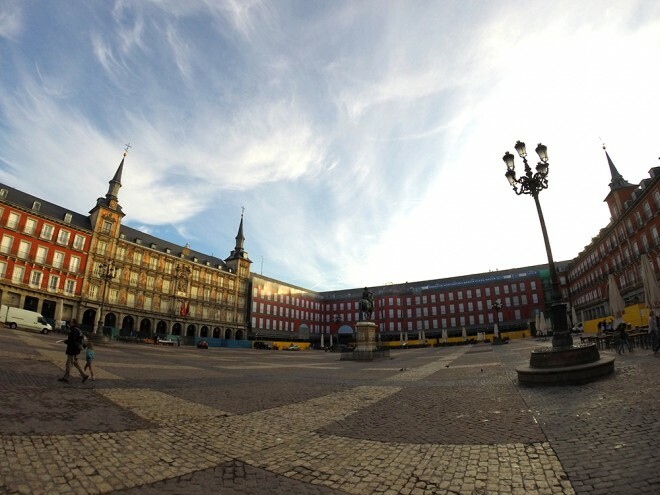 I agree with you about Plaza Mayor, it was hard to capture a nice picture of it. It’s hard to make it justice, probably because is a square and it’s hard to pick all of it in one photo. I want to return to Spain in general… maybe a couple of days in Madrid, yes, but I also want to go back to Sevilla and Granada, and I want to spend a week or two up north – Galicia, Asturias, Picos de Europa, etc. It’s the area I liked most when I studied there but one I explored the least. That’s a great idea!! I still haven’t been to Sevilla, I want to go there next time for sure! It’s very… non-Spanish. Green rolling hills just like in England! Really?? I would never guess that 😀 I see very colourful pictures of the buildings and I love it! AMAZING!!! I hope to go there sometime!! hahaha I thought of you when it happened to me!! Though you spent more time in Riga than I did in Madrid. 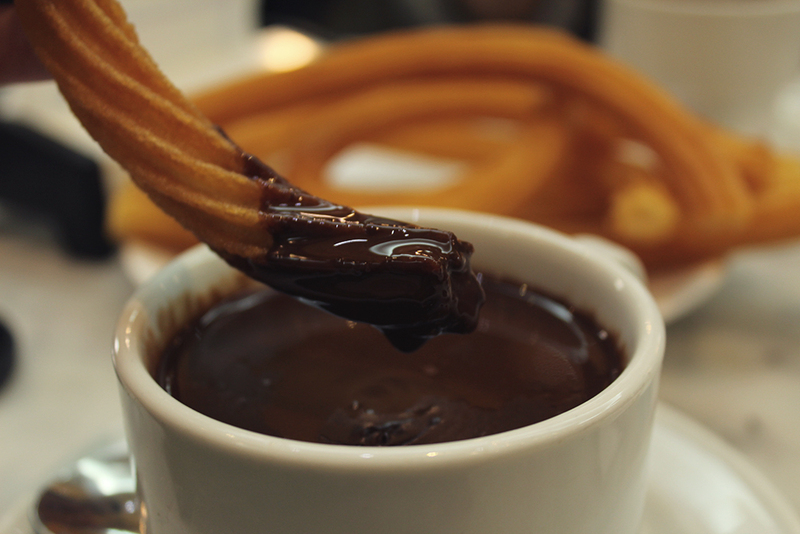 Ohhh the churros there are delicious aren’t day? Next time I have to go there again!! I know right? Having a local friend helped a lot, I think I couldn’t have done it alone, specially because I was soooo tired. I was dead on my feet hahaha the churros in the morning certainly helped!! And I aso didnt know about the Egyptian Temple, it was new to me too! So interesting! Madrid is an amazing city, I hope you get to visit it someday, I love it! Are you in Madrid or still back and forth? I had an amazing day in Madrid thanks to you!